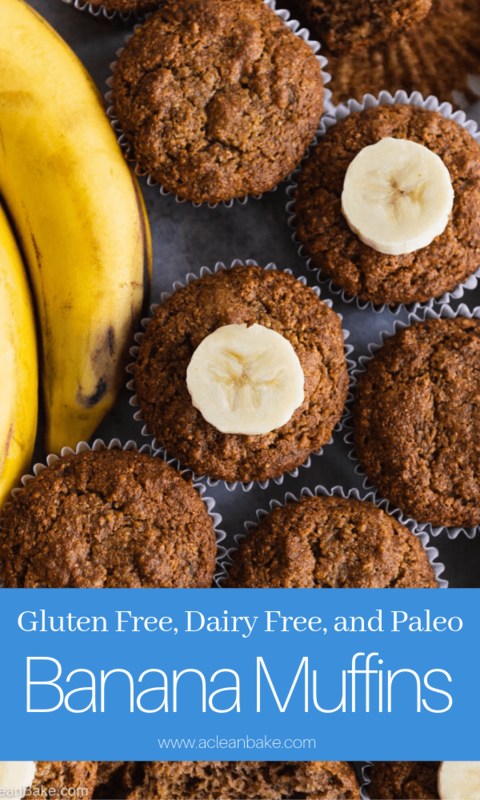 Classic paleo and gluten free banana muffins are so easy to pull together, and they boast a rich, warmly-spiced bakery-style flavor that you know and love. These muffins are pure nostalgia – minus the gluten, grains, and artificial ingredients! When it comes to changing your diet, and keeping your family on track, the hardest things to give up are the basics. You know, those classic flavors and familiar dishes, maybe from childhood, that are, all of a sudden, off the menu? That’s why I post so many grain- and gluten free recipes that are as similar as I can get them to the real thing, but without sacrificing the wholesomeness and nutrition I know you’re looking for. Because I am too. With all that being said, here’s the real story behind these muffins: my child would, if allowed, live on muffins. Not cake, not cupcakes (although he’s warming up to those too). Muffins. Muffins and pasta would be a dream diet for my carb-loving child. And sometimes I just don’t have the heart to say no to him anymore. So I’ve been on a mission to make better-for-us versions of the pastries that he craves, full of fiber, healthy fats, and even subtle veggies (although these banana muffins don’t contain veggies, sadly). That’s why you’ve seen so many gluten free and paleo muffins here and on Instagram lately! 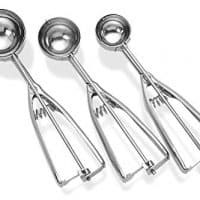 They’re lightly sweetened, fluffy, domed perfection and they make a wonderful baking project for your little kitchen helpers. 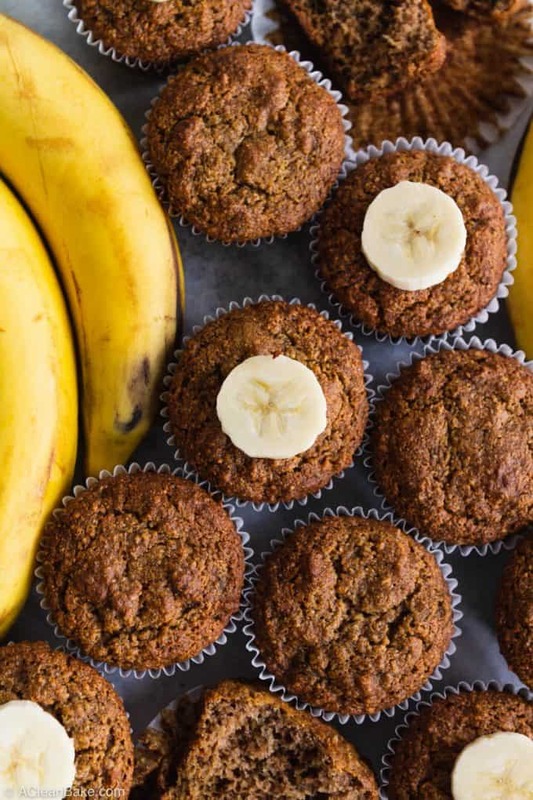 There are a million gluten free banana muffins out there – and probably a million more paleo banana muffins, too. Why these? Well, I could just tell you they’re the best. Trust me. 😉 But, ok, I’ll give you a little more than that! First, they’re fast and easy to make, and – as far as baking goes, make a minimal mess. All you need is two bowls and a couple of forks. What do you need to make these muffins? 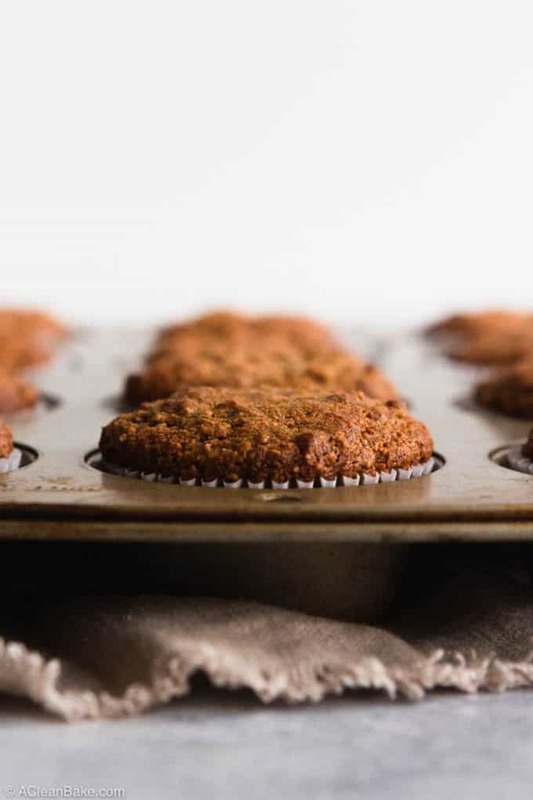 All you need is a handful of (grain- and gluten free), all natural ingredients to make these muffins: a few grain free flours (more on those in a minute), some low-glycemic coconut sugar, cinnamon, baking soda, and salt make up the dry ingredients mixture. The wet ingredients include eggs, maple syrup, and apple cider vinegar. Yes, vinegar! 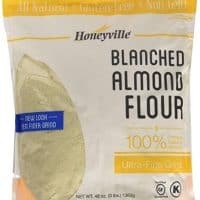 If you’re curious why this recipe contains a splash of ACV, scroll down and read the section called “Can I replace the baking soda with baking powder?”. There is no added fat in this recipe. Well that’s not true. There is fat in the almond flour, the egg yolks, and the coconut flour. 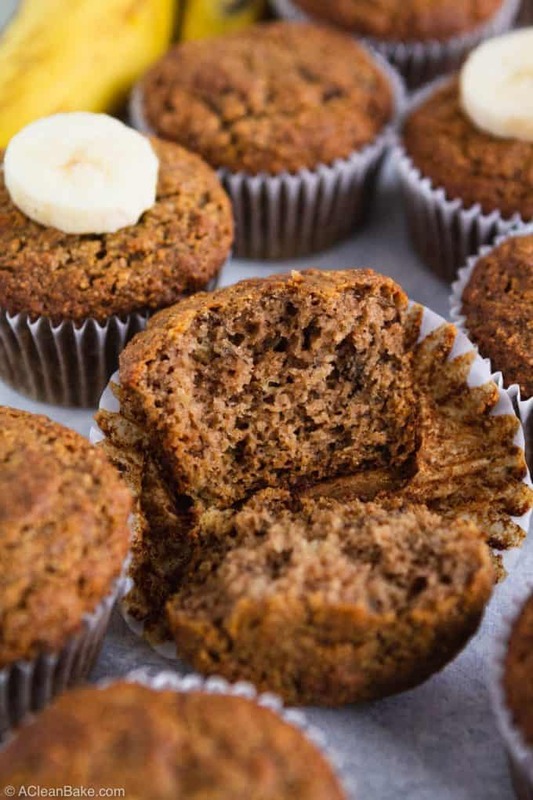 That combined with the bananas, make the muffins as moist as they need to be – and keep them dairy free, too! Any additional butter, avocado oil, or coconut oil in this recipe will make the muffins greasy, and we certainly don’t want that. You also need a large bowl (for the dry ingredient, and for mixing the wet into the dry), a medium bowl (for the wet ingredients), and a couple of forks or spoons for mashing the bananas and stirring the batter. What about Gluten Free Flour? I call these gluten free muffins, but they’re actually made from grain free and gluten free flour blend containing almond flour (sometimes called almond meal; you can read more about that here! ), coconut flour, and arrowroot flour. There is no gluten free all purpose flour, and no xanthan gum (or any other gums that you often see in gluten free baking!) 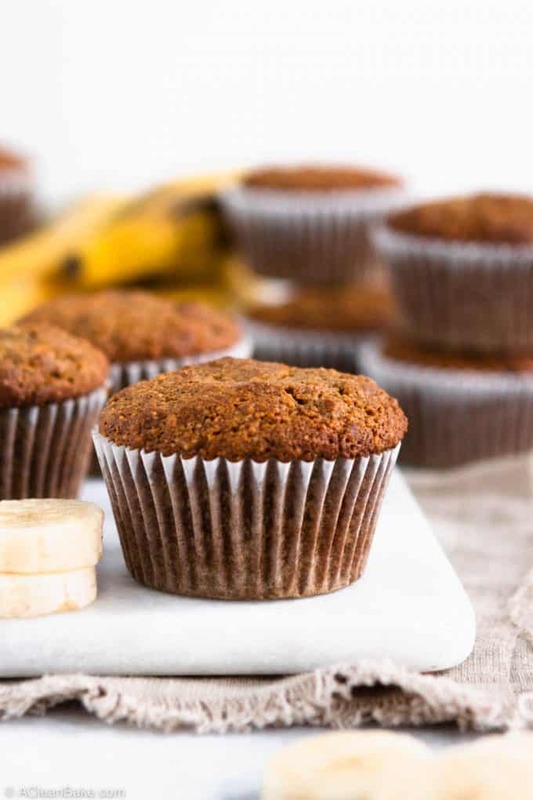 required to make these tender banana muffins. Here are the answers to some common questions that I know you may be asking about this muffin recipe ! If I missed anything, please leave me a comment below the post and I’ll do my best to answer it. Can I add nuts, fruit, shredded coconut, or chocolate chips? Yes, of course! You can add 3/4 cup of whatever flavors you’d like. Try finely chopped nuts, dried fruit, or of course, chopped dark chocolate, and don’t forget to sprinkle a little extra on top of the muffins before you bake, for some pizzazz. 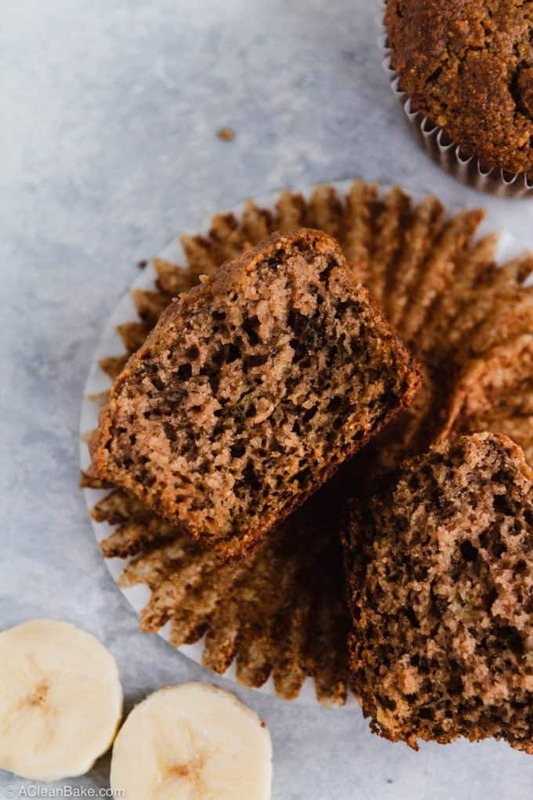 Banana nut muffins are a classic, but banana chocolate chip muffins sound like a breakfast I’d get out of bed for, that’s for sure! Try to stick with dry ingredients though. If you’d like to add fresh fruit, I’d suggest using my blueberry banana muffin recipe instead, and you can swap out the blueberries for whatever you’d like to use (although, the blueberry muffins as written are 👌). How ripe are “ripe bananas”? Great question. You’re looking for bananas that are past their prime. Make sure the bananas you want to use are very speckled, soft (they give if you squeeze gently) and smell sweet when you peel them. You can also use overripe bananas. The browner and softer they are, the more sweetness they’ll bring to the muffins. How important are room temperature eggs? In this recipe, the temperature of the eggs is medium important. Technically speaking, you should be using room temperature eggs in all of your baked goods, since they will distribute better than cold eggs throughout the batter. If you forgot to set out your eggs ahead of time, to come to room temperature, you can immerse them in a bowl of warm water for about 10 minutes before you mix them into the batter. Or, failing that, just use fridge-cold eggs. It’s not ideal, but it won’t ruin your muffins. Life happens, right? Speaking of eggs, can I make this vegan? I have not tested this recipe with flax eggs, or any other egg replacement, so do so at your own risk. Can I convert this to recipe to banana bread? Not only can you; you definitely should. No, but seriously, this recipe will work great as banana bread, if you bake it in an 8″ loaf pan instead of in a muffin tin. The baking time will probably be around an hour. Or, you can use the classic banana bread recipe that I posted a few years ago. People love it! Or there is this fancy-pants banana bread with dates, pecans, and caramel glaze. If you don’t avoid grains, I have a gluten free banana bread recipe from wayyyy back in the early days of the site, which you can find here. That one contains a gluten free flour mixture of oat flour, sweet rice flour, and psyllium husk (an alternative to xanthan gum that helps the bread retain its rise). Can I replace the baking soda with baking powder? I get this question a lot. No, unfortunately, you cannot replace baking soda with baking powder. Baking soda is a pH basic ingredient that reacts with an acidic ingredient in the batter to create air bubbles and, in doing so, helps the muffins rise. Baking powder, on the other hand, is a mixture of a base (baking soda), an acid (cream tartar) and, typically, a starch (cornstarch) to help with texture, making it inappropriate for anyone on a grain free diet. That’s why I typically stick to using baking soda in my recipes. And that’s also why you’ll almost always see a small amount of vinegar in my recipes. Don’t worry – you can’t taste it once it has reacted with the baking soda! Your muffins will not taste vinegar-y in the slightest. 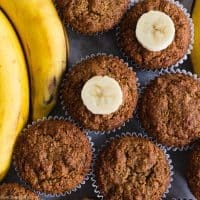 How can I add even more nutrients to these muffins? I totally get where you’re coming from. I always want to maximize the nutrition of everything my son eats, because it’s so hard to feed him! But I wouldn’t recommend changing the recipe much from what is written, aside from the add-ins I listed above. Instead, here’s what Ive done that has worked well: Slice the muffin in half and slather with peanut butter, almond butter (since we are, after all, talking about a paleo recipe), or sunflower seed butter. Then use the tackiness of the nut or seed butter to adhere a sprinkle of nutrient rich seeds like chia, flax, or hemp. If your child is picky, and sensitive to new textures, used ground up seeds (chia seed powder, flax meal, etc.) instead. Can I make these sugar free? You can replace the coconut sugar with granulated stevia or monk fruit, but they will be more dry and crumbly than they appear in the photos, since low carb sweeteners aren’t hydroscopic (meaning they absorb, retain, and distribute moisture), as coconut sugar is. Can I make these ahead of time? Yes, of course! I would never give you a recipe that required you to get out of bed at the crack of dawn. 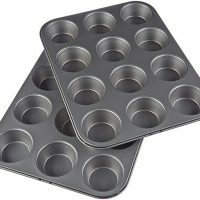 You can store fully-cooled muffins in an airtight container on the counter for up to three days, or for 5-7 days in the fridge. You can also freeze them for up to three months. The hardest part about cooking for a younger kids is, as I’m sure you other parents house there can sympathize, finding the time, energy, and creativity to make dishes that the whole family will enjoy. 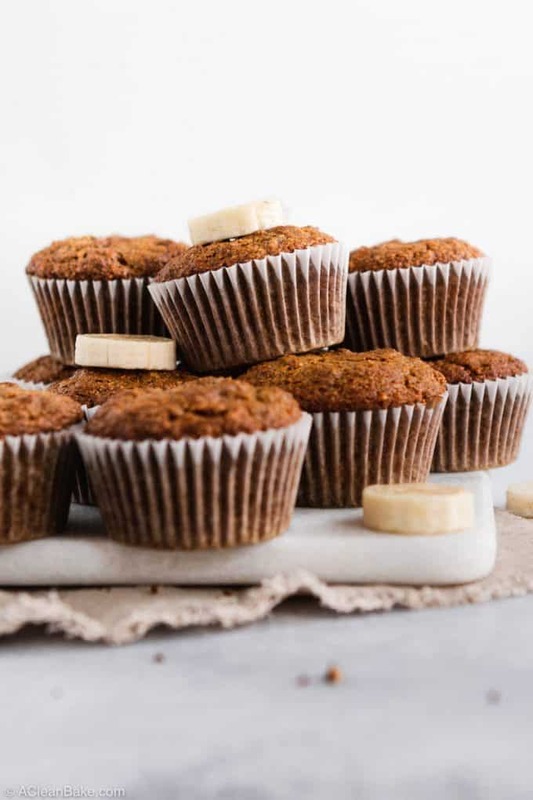 Well, I can’t always help you with lunch or dinner, but these paleo and gluten free banana muffins are one of my favorite solutions to the challenge of breakfast (especially since they can be made ahead and they freeze so well!). I hope they’ll be yours too. 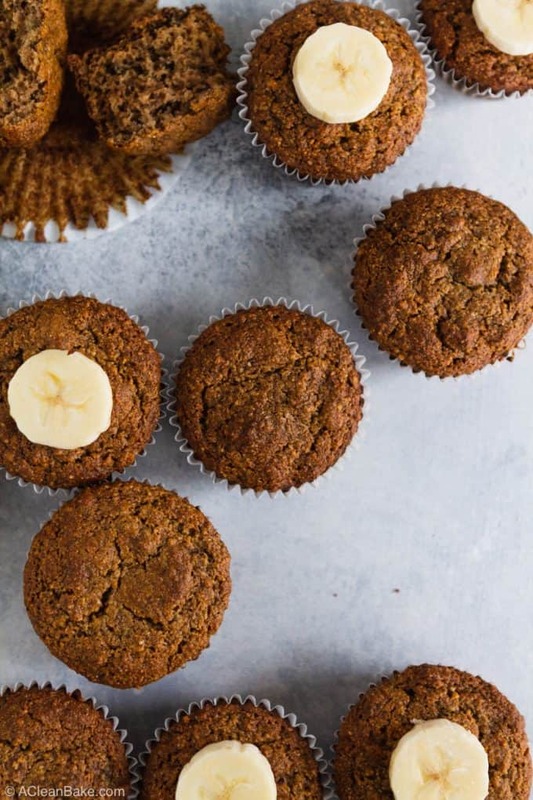 PS: you can see all of the gluten free and paleo muffins on the site here. 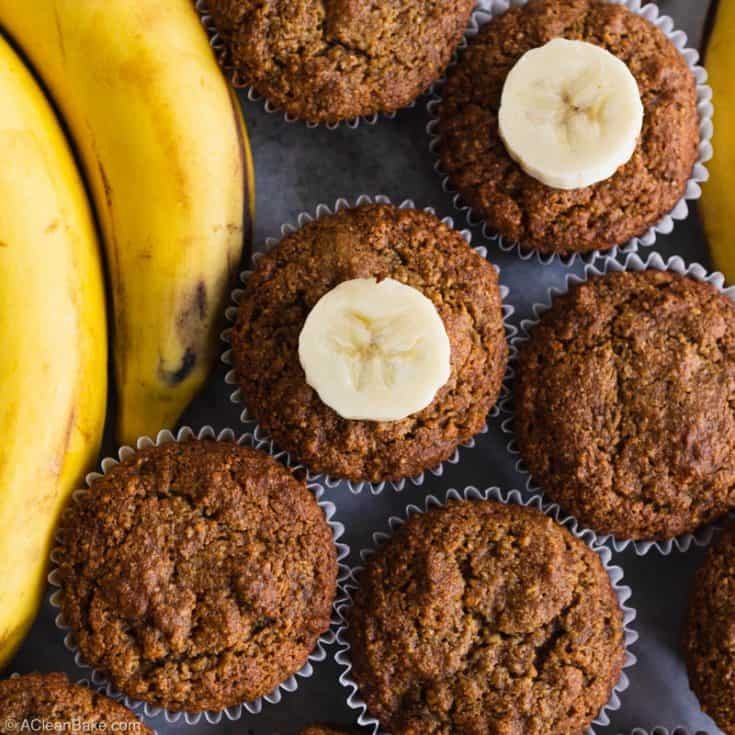 Classic paleo and gluten free banana muffins are so easy to pull together, and they boast a rich, warmly-spiced bakery-style flavor that you know and love. These muffins are pure nostalgia - minus the gluten, grains, and artificial ingredients! Preheat the oven to 350 degrees F. Line a muffin pan with papers and set aside. In a large mixing bowl, whisk together the almond flour, arrowroot flour, coconut sugar, coconut flour, cinnamon, baking soda, and salt. Set aside. In a medium bowl, lightly beat the eggs, then stir in the maple syrup, vanilla extract, vinegar, and banana. Pour the wet (egg-banana) mixture into the dry (flours) and stir until well combined. No large clumps of flour or banana should remain. Fold in your chocolate chips, chopped nuts, or other add-ins, if using. Sprinkle the tops of the muffins with addition chocolate chips, nuts, etc., if you want. Bake for 23-26 minutes, until the muffins are domed and slightly springy when you press them gently. Cool in the pan for 5 minutes before removing the muffins and transferring them to a wire rack to cool completely. Make sure the bananas you want to use are very speckled, soft (they give if you squeeze gently) and smell sweet when you peel them. You can also use overripe bananas. The browner and softer they are, the more sweetness they'll bring to the muffins. Store leftover muffins in an airtight container at room temperature for up to three days. Or, stash them in the fridge for up to a week and in the freezer for up to three months. Nutrition information does not include any add-ins or toppings. Thanks for your good website and information !